Do Creamsicles and flowers go together? Both are things we look forward to when spring starts to appear, so I’m going with yes. This week I’ve been working on an assortment of odds and ends, and in the margins I decided to whip up a new chevron collar with a little twist. It occurred to me that since the outer edge of the curved chevron pattern has five seed beads, and a daisy stitch is three beads wide, add two more beads for bumpers and it’s a perfect fit. I wasn’t really sure where I wanted to go with the idea until I decided I wanted to use up some of these lustered orange seed beads I have that never seem to fit anywhere. The solution to that is just make them the focus of a design. This piece just needs a clasp, then it’s on to more top secret experiments. I can give you just a little hint about what I’m working on - it involves lifting a few of my bead taboos, and I couldn’t be more excited about finally letting go a little. I’m going to have a lot of fun making some designs that have never before been seen in my studio! 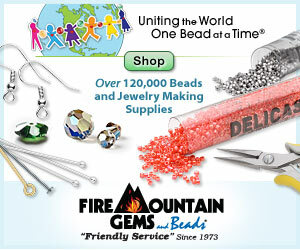 The past 14 months have been filled with amazing inspirations and beading successes. My personal beading challenge to create a piece of jewelry for the most popular Egyptian gods has been a great learning experience in many ways. Most of all I learned just how much of a workload I can handle, especially when taking on a lot of elaborate designs. I had two more pieces in my to-do list – a collar for Ra and a rope necklace for Wadjet. It was a bit of a disappointment to have to carry the challenge into 2014, and now I’m afraid that I’m going to be cutting it short before completion. I’m clearing everything off of my plate to work on an important side project, and that means it’s time to bring this challenge to a close. To save time for getting all of the pieces completed this year, I’ve skipped sharing updates of finished pieces. These are the designs that have made it through – some of them are my among favorites for the entire challenge. For Shu, the god of air, I created a new ombre lariat with blues and whites. I’m incredibly fond of this design overall, especially when blending colors together. For this necklace, I got to include some striped Java glass, which is always a welcome treat when beading. Although the colors didn’t blend quite as well as some of my other ombre designs, I still love the combination of whites, blues and browns for the god of air. 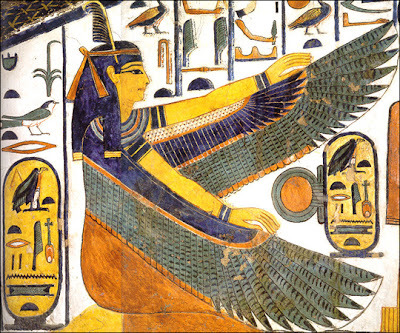 For Tefnut, the goddess of moisture, I ended up combining a lot of different inspirations. Water, serpents, the sun disk of Ra - this necklace was a hodgepodge of ideas relating to the first divine mother. To bring everything together, I stuck to a fairly simple palette, with a splash or two of gold for Ra. My favorite thing about this piece is the combination of color blocking and stripes in the fringe - something I’m definitely going to come back to in future designs. Next was Thoth, the god of scribes. Whenever the essence of a god or goddess is difficult to capture literally, I’ve usually gone with a collar in the god’s colors. This time I took the opportunity to change things up a bit with a new design. It took forever to stitch, but it was a really worthwhile experiment. I combined papyrus-like colors with stripes and Nile hues for this necklace, along with ibis inspired long daggers. And the final design in this challenge is a Sa amulet necklace for Tawaret. The hippopotamus goddess was often shown holding the Sa amulet, so I attempted to capture the look of that symbol with colors inspired by the Nile and hippos. The beadwork took a lot longer than it would seem for the end result, so I probably wouldn’t duplicate this piece, but it turned out just how I wanted. Thank you so much for joining me and reading along with this very rewarding challenge! I had hoped to have a new challenge underway by now, but it has been put back on the drawing board until I’ve wrapped up my new project. In the meantime, I do have some fun ideas for quick new designs that I’m looking forward to sharing whenever I can. Here on the West Coast we’ve been lucky enough to have a few days of mild weather and sunshine, providing the first few opportunities for spring explorations. Last year our family’s nature expeditions focused a lot on bugs, but this year mosses and fungi have grabbed our attention. Perhaps it’s due partly to the very abundant mushroom season we had this past fall, when the entire view from our patio window was filled with enormous orange milk caps. Now we’re on the lookout for strange and unusual plants everywhere. When you take the time to really look closely, these hardy little life forms are abundant and sometimes beautiful. Studying plant patinas can certainly be inspiring, with their organic patterns and quirky color combinations. With lichens and fungus in mind, I wanted to try out some new spring color palettes starting with an organic looking focal. The perfect choice were some speckled, Picasso finish ceramic drops. The unusual pear shape certainly looks like it could be found out in the woods, and the colors bring to mind the mottled bark of an old tree. Starting with a little inspiration from the eggy-beads themselves, I added seed beads in robin’s egg blue. This color picks up and enhances the light undertones of turquoise in the drops so well, that the only possible option to complete this Bird’s Nest palette would be terracotta brown. It complements the speckles really well, while also adding a bit of warmth. With this first success, I decided to try another blue on for size. Transparent aqua adds a watery, raindrop feel, while also giving the impression of a Cloudless Sky. Rather than splash more color, I added some jet black for a neutral background, although some dark gray or mossy green may have been even better. Finally, I couldn’t resist going back to one of my all time favorite spring palettes. Wisteria-lined crystal has the perfect purple hue of new flowers, while transparent lemon lime AB provides a sour Splash of Life. This pair always works when a cheerful look is needed, and they both bring out the gorgeous greens of the ceramic beads. Have you been inspired by nature recently? How did it take shape? I’ve been a bit overwhelmed by my to do list of late, and I’m way overdue for a bead tray update. This week I’ve been working on wrapping up some projects, as well as experimenting with new stitches and a few little inspirations. Right at this moment, I’ve got a handful of simple beaded beads that I’ve been playing with for an upcoming project. I just threw together a few favorite colors and got stitching. It’s been really fun! It’s interesting how different a technique can look just by changing up the placement of colors. In other news, I’ve got a brand new camera and it’s my absolute favorite thing right now. The old one was dropped by a certain small person, right on the lens while it was open. After that, I couldn’t get it to take a clear photograph, and it was time to invest in something new. Even though I bought one of the least expensive models available, it’s still way better than what I was working with before. The new camera is a Nikon COOLPIX, and my favorite feature - apart from the crystal clear photos it takes - is how lightweight it is. I’m looking forward to trying it out a lot more in the coming weeks. I’ve already finishing photographing the new rope necklace I was working on, which turned out pretty great. It was a lot more work than was worth it for the results, but it looks exactly the way I wanted it to. Last week’s bead giveaway had a wonderful turn out, and as always your answers to our inspiration question were wonderful. Reading about all of your favorite spring sights, smells, and sounds definitely makes one long for an end to snow. I love this vision of soft colors and budding growth - just imagine a beautiful palette of creamy pearls, purple silk, and green glass! Thank you so much to everyone who entered the giveaway. 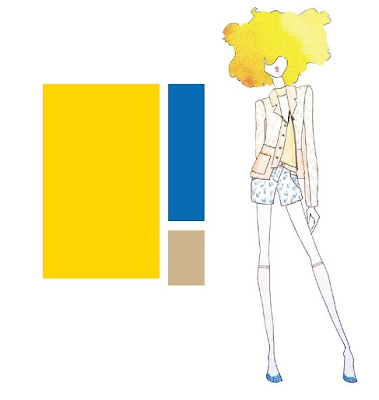 May you have amazing color inspirations this spring! For our final look at Pantone’s spring colors, I’ve saved the best trio for last. This combination of Dazzling Blue, Freesia Yellow, and Sand is so intense and tropical, it totally drives the winter blues away. Emily Saunders’ sketch with shorts and stockings definitely speaks of early summer, and those perfectly warm days that arrive right on the tails of spring. Statement jewelry is even better when it includes bold, contrasting colors. Blue and yellow are eye-catching and exciting in any design, but I was particularly thrilled with a gorgeous leather cut-out necklace by Boo and Boo Factory. I paired it with two equally cute outfits including shorts and layered tops. The warmth of Sand is a perfect neutral in this trio, adding a touch of earthiness to balance everything out. This is especially helpful when working with prints, and the beige pieces make a great backdrop. The Neon Bean Necklace from High on DIY uses a mixture of found objects and upcycled pieces. Use tulle and your favorite beads for a sparkly variation! Even more upcycling awaits with the Aztec Bib Necklace Tutorial on Jewelry Making Journal. Create a chic necklace using wire scraps! Combine your favorite colors and lots of texture with the Mixed Media Collar project from Stripes and Sequins. Simple and beautiful - learn to make a leather cut out necklace on A Nest for All Seasons. Do you like to use bright contrasts in your designs? What’s your favorite combination? After months of winter, bright and vibrant spring colors can be a welcome treat - but the soft pastels are not to be forgotten. White blossoms, soft green buds, even the mud left by spring rain provide a welcome splash of color after all the winter grays. This month I have a beautiful mix of tiny beads in the subtle colors of a garden just starting to bloom. The mixture includes vintage acrylic: cube beads in pink and transparent brown; golden drops; faceted rounds in pink, green, topaz and purple; and pretty translucent rounds in green, peach and white. All of the beads are 3 and 4 mm - perfect for accents in kumihimo, crochet, or multi-strand designs. 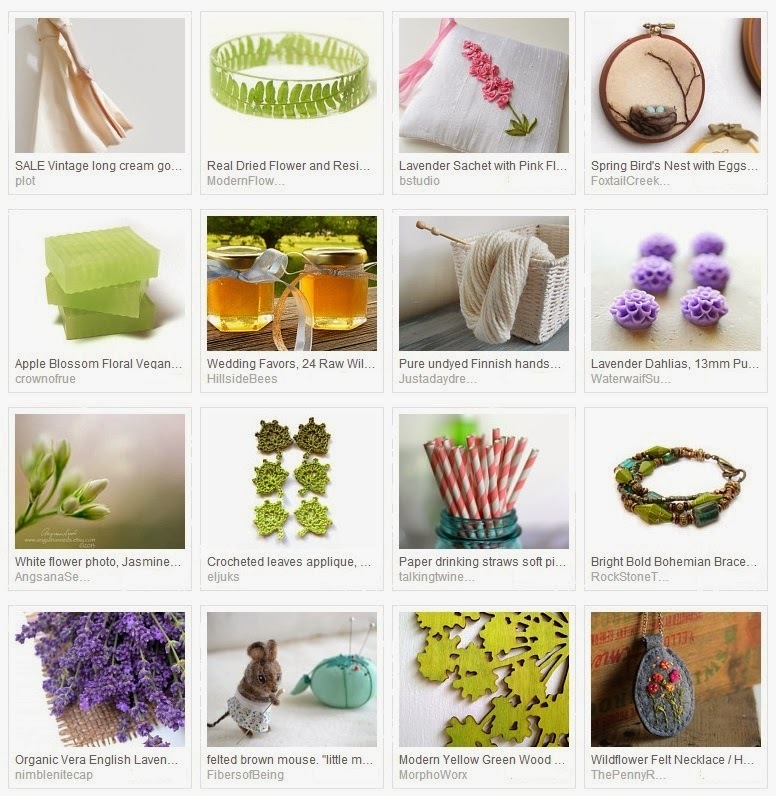 For a chance to win all of the beads shown, leave a comment on this post answering the following question: What is your favorite spring inspiration? Important: Comments must be made here on Inspirational Beading to qualify. Please make sure to include a contact method in your comment, or through your profile, so that I can get in touch with you if you win! Incomplete or duplicate entries will not be included in the draw. One lucky winner will be drawn on Tuesday, February 11th. This giveaway is open to all international readers. Good luck! One of the best words we can use to describe the beading process is meditative - beading is relaxing, contemplative, and a wonderful way to fill the hours. Of all the techniques available for weaving beads together, crochet is one that allows us to work continuously, making it one of the most meditative of all. 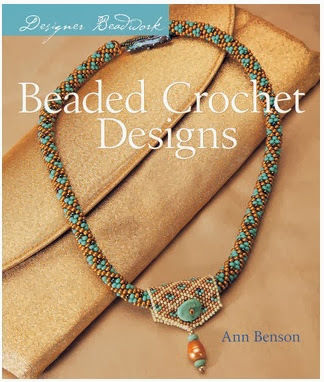 In Beaded Crochet Designs, Ann Benson helps readers explore the beauty and versatility of this unique combination of techniques. Using some of the stitches that fiber crocheters use, one can create the most beautiful, flexible and delightful jewelry. Like any great beading book, this one begins with a detailed basics section, explaining the ideal materials and tools needed to get started. The Getting Ready chapter includes up to date descriptions of common bead and thread types used for bead crochet, as well as an excellent primer on the stitches. There are both photographs and diagrams of tubular bead crochet and finishing techniques, so even a beginner can grasp how it is done. There are also some basics for other bead weaving stitches used in the projects, however simple jewelry making techniques like making wrapped loops are not covered, making this book ideal for beaders with some previous experience. The projects include detailed materials lists and a quick guide to the steps with occasional diagrams. Beginners can try out some of the simpler projects to practice and become familiar with the concepts used to make bracelets, necklaces, and earrings. Though many of the projects use unique materials, there is some emphasis on repetition, including several bangle projects that only require a change of pattern and color choice. Beaded Crochet Designs is an excellent resource for beaders who want to try out bead crochet, and provides plenty of inspiration and beautiful practice pieces to make. If you want to master this beautiful technique, definitely look for it at your public library!